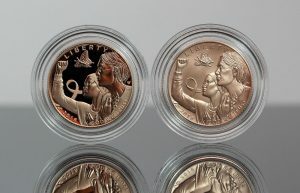 CoinNews photo of two 2018-W $5 Breast Cancer Awareness Gold Coins. These and other U.S. Mint gold coins could see price increases on Wednesday, Oct. 17. On Wednesday, Oct. 17, the United States Mint is likely to raise prices on eighteen gold products made for collectors. The U.S. Mint’s collection of gold coins have prices that can change weekly based on the trending value of gold as compared against its 2018 pricing matrix. The agency’s current coin prices are based on an average of gold that is within $1,150.00 to $1,199.99 an ounce. Gold is now trading over $1,228 an ounce. If Wednesday’s LBMA gold price PM price remains higher than $1,199.99 an ounce, then prices of U.S. numismatic gold coins will rise by as much as $50 for every ounce of the precious metal they contain. The U.S. Mint has made eight previous pricing adjustments this year because of the changing gold market, raising them three times and lowering them five times. Past adjustments have tended to happen on Wednesdays at around 2:00 p.m. ET. This article will be updated with what actually happens. Update: The U.S. Mint raised gold coin prices.